WASHINGTON (AP) — Leading House Democrats will offer a resolution Wednesday condemning anti-Semitism in response to Rep. Ilhan Omar’s latest remarks on Israel, a senior Democratic aide said. The declaration, written by Speaker Nancy Pelosi and other Democrats, comes after Omar’s new remarks suggesting American supporters of Israel are pushing people to have “allegiance to a foreign country.” It’s at least the third time the Minnesota Democrat’s words have put her colleagues in a more delicate spot than usual on the U.S.-Israel relationship, and the second time in two months that she’s drawn a stern backlash from party leaders. A draft of the resolution does not rebuke Omar, a Somali-American and one of two Muslim women in Congress. But it sets out the history of anti-Semitism and bigotry in America, including anti-Jewish tropes about divided loyalties. The document also rejects bigotry directed against Muslims after the Sept. 11, 2001, attacks. The document is the written embodiment of the bind in which Omar has repeatedly put Democrats who have celebrated her election as part of the history-making class that helped flip control of the House in the November elections. The March edition of Rolling Stone magazine is covered by a photo of Pelosi and the next generation of House women, including Omar. Omar didn’t start the internal Democratic chafing over Israel, and she’s not unfamiliar with bigotry. The FBI and other law enforcement agencies are looking into a report of a threatening graffiti message directed at her. She also was the target of an anti-Muslim poster that appeared last week at the West Virginia Capitol in Charleston, with her picture over an image of the World Trade Center’s burning towers. Omar says she’s questioning the U.S. relationship with Israel and the influence game in Washington. “I should not be expected to have allegiance/pledge support to a foreign country in order to serve my country in Congress or serve on committee,” Omar tweeted back. 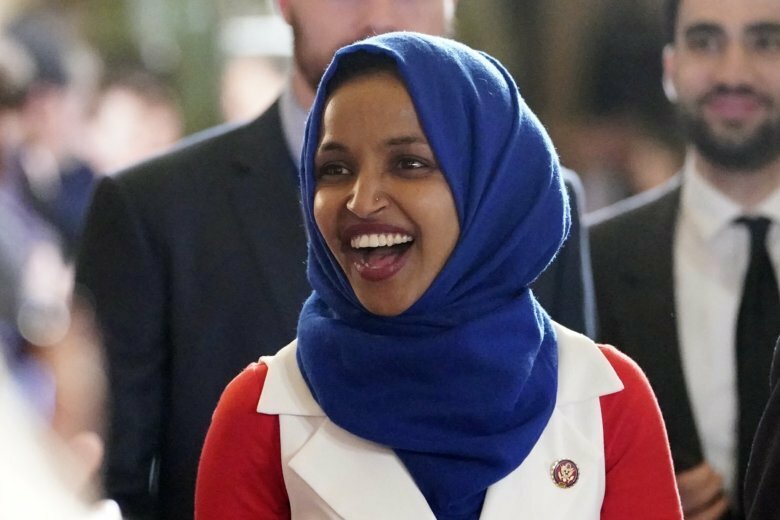 Last month, Omar ignited a bipartisan uproar in Washington and Minnesota when she suggested on Twitter that members of Congress are paid by the American Israel Public Affairs Committee to support Israel. AIPAC is a nonprofit organization that works to influence U.S. policy. Many progressive Jews rushed to her defense, however, saying it’s not inherently anti-Semitic to criticize Israeli government policies or AIPAC. Omar’s spokesman, Jeremy Slevin, said she is not criticizing American Jews or their faith, only offering a “fair critique” of Israel’s powerful lobby. Some have suggested that Omar be stripped of her seat on the House Foreign Affairs Committee, a move Pelosi and Chairman Eliot Engel, D-N.Y. have so far resisted. But Engel’s statement on Friday mentioned his panel and conduct becoming a member of the House. “It’s unacceptable and deeply offensive to call into question the loyalty of fellow American citizens because of their political views, including support for the U.S.-Israel relationship,” Engel said in a statement that also suggested she apologize.